Anyone paying attention to the degradation of our natural world is aware by now of the plight of native pollinators like bumble bees and of colony collapse in honey bees. It is a vexing problem with no single cause. It is happening by a thousand tiny cuts as a result of habitat loss, disease, parasites, climate change and pesticide use. It is estimated that one-third of our food items depend on pollinators. They also play a key role in biodiversity, as over 85% of the world’s flowering plants require bees, wasps, flies, bats and even hummingbirds for their reproduction. Any organism that consumes seeds, fruits or vegetables, is dependent on the services provided by pollinators. This includes not only human beings but countless other species as well. No one is more familiar with bee decline – and the lessons it contains for the future of human society – than Dr. Mark Winston, a world bee expert and Professor of Biological Sciences at Simon Fraser University. 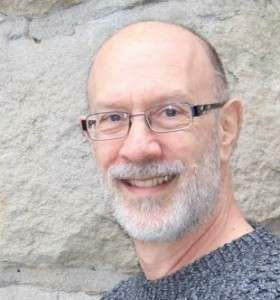 Mark is also a senior fellow at Simon Fraser’s Centre for Dialogue, which creates a space for “respectful conversations between diverse stakeholders, where mutual curiosity and collaborative inquiry act as alternatives to adversarial approaches.” As a former director of the Centre, he achieved international recognition by creating leadership development opportunities for students that contribute to social change in communities. Much of his work still involves advancing communication skills and engaging public audiences with controversial issues through dialogue. Effective public interaction and honest dialogue are especially important right now. Pending decisions on oil pipelines, fossil fuel resource development and carbon taxes threaten the delicate balance between economy and environment. This weekend, Mark Winston will be the keynote speaker at a Pollinator Summit hosted by Peterborough Pollinators. In collaboration with local non-profits, businesses and community members, the summit will be a two-day celebration of bees, pollinator gardens, community-stewarded urban beehives and, maybe most importantly, of dialogue. Dr. Winston will be speaking Saturday evening at 8 pm at Market Hall. It promises to be a presentation rich in storytelling, connecting to nature and learning what lessons bees have for humanity. A book signing and a Honey Fair showcasing the products of local honey producers will start at 7 pm. Tickets are $28 ($18 for students) and can be purchased at the door. On Sunday, May 6, there will be an opportunity for people to visit some of Peterborough’s outstanding pollinator gardens and urban beehives. The public is also invited to participate in a community dialogue with Dr. Winston and local community dialogue practitioner Ben Wolfe. It will take place at Lett Architects on Simcoe Street. This “cross-pollination” dialogue, which is almost full, will bring together community members, beekeepers, gardeners and conservationists. It will explore the question: How do we empower citizens to protect pollinators and, in doing so, create, restore and celebrate natural environments? For the past three years, Peterborough Pollinators has focused on this very question. 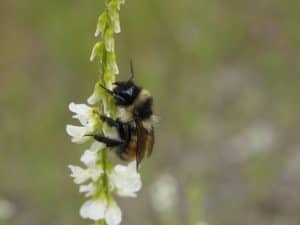 The group has been working to encourage the creation of pollinator habitat including gardens of all sizes throughout the Kawarthas and on educating the public about the importance of pollinators. Not only do these gardens help pollinators, but they also bring greater food security, sense of place and community development to our neighbourhoods. Drawing on a three-decade career researching killer bees, pollination and honey bee communication, Mark Winston is an eloquent and impactful communicator of science to the general public. He is that rare scientist who can take complex science and repackage it something a general audience can understand and appreciate. In addition to being a frequent guest on radio and television, Dr. Winston has had a distinguished career writing and commenting on environmental issues. His award-winning book “Nature Wars: People vs. Pests” has been recognized as the most probing and thoughtful discussion of pesticide use since Rachel Carson’s “Silent Spring”. Winston is also the author of “Bee Time: Lessons from the Hive”, which won a 2015 Governor General’s Literary Award. 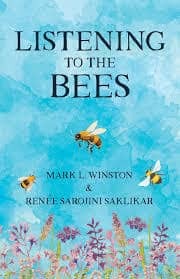 Most recently, Winston is the co-author of a new book, “Listening to the Bees”, with Canadian poet Renée Sarojini Saklikar. The book is something quite rare – an interaction between the poet and the scientist. It is a compendium of Winston’s research, accompanied by Saklikar’s poems inspired by this research. Saklikar, who is best known as the author of “Children of Air India”, has had a life-long interest in bees. She takes the poems in directions that connect to what the research was about and to her own Indian culture. Like us, honeybees represent a pinnacle in nature of animal sociality. How they submerge individual needs into the colony collective provides a lens through which to ponder human societies. In “Bee Time: Lessons from the Hive”, Winston explains how bees process information, structure work and communicate. He also examines how corporate boardrooms are using bee societies as a model to improve collaboration, how bees have altered our understanding of agricultural ecosystems and how urban planners are looking to bees in designing more nature-friendly cities. Bees inhabit a world of chemical communication, which involves more than 40 different compounds. It is a world we neither see nor hear. Winston’s focus on bee communication has made him realize how poorly we humans communicate with each other – do we really see and listen? – and how little we understand the various channels we use. Bees have other important lessons to teach us. For example, a typical honey bee colony contains residue from more than 100 pesticides. Taken singly, each is relatively benign, but together their interplay can have serious impacts. These include reducing the effectiveness of bees’ immune systems, which leaves them more susceptible to disease. What’s happening to bees as a result of pesticides is a useful lens to consider human health. Winston believes that the interactions of pesticides on bees can be compared in some respects to the interaction of prescription drugs on humans. Each, on its own, provides benefits, but when numerous drugs are used together, the interaction can cause harmful side-effects, particularly in patients who are already diseased-compromised. As human beings, we cannot afford to ignore what the demise of bees tells us about our own tenuous relationship with nature. There is much to learn from bees in how they respond to the many challenges they face. In sustaining their societies, bees teach us ways to sustain our own. It is his hope that by communicating about the glory and the plight of all our pollinators, maybe we can make a positive difference in their future – and ours. For more information on the Pollination Summit, please go to peterboroughpollinators.com. 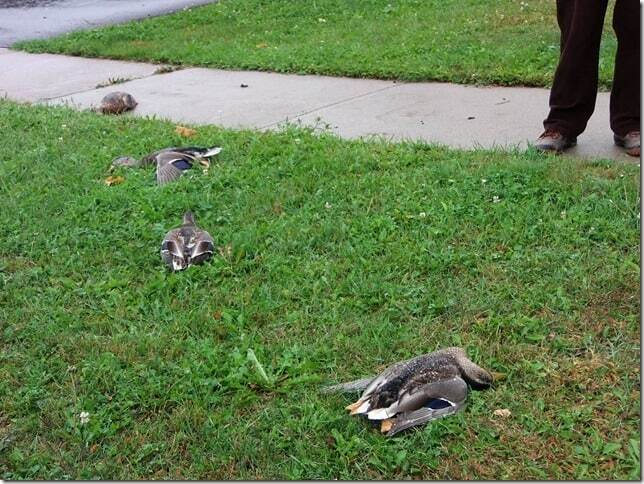 At around 10 a.m. on Sunday, September 3, residents in the Tobin Court and Evans Dr area in the north end of the city, reported the sudden death of 12 Mallard ducks. Earlier a group of 14 ducks was observed walking up Tobin from a local pond just south of that location, munching on grass. They did not display any distress at the time. Moments later 12 of these ducks lay dead on residents’ lawns and driveways.The police were called as well as the MNR, Humane Society and the City of Peterborough. Public works attended the scene to remove the bodies. In the meantime 2 ducks which had been immobilized and stunned by the unknown contaminant were transferred to Shades of Hope Wildlife Rescue in Pefferlaw. Residents in the area are concerned about what could possibly have caused a quick death to so many ducks. According to one of the residents, the Peterborough Police will notify the MNR to investigate the sudden deaths. N.B. The necropsy results were released by MNR on December 16, 2017. They ruled out poisoning. They did extensive testing for botulism, which is a reason that the results took so long. The results for botulism were negative, as well. However, they did indicate that botulism is extremely tough to test for and can result in false negative test results. So, it looks like we will never know what exactly happened but, if anything the neighbours can be assured that it was not as a result of poisoning. Where have the Monarchs gone?